You would hardly call the Northumberland village of Seahouses off the beaten track because it’s far too popular with day trippers and holidaymakers for that – but how many people know that it is the location of a first-class music venue? Perhaps not as many as Jeff and Jill Sutheran, who own the St Cuthbert’s House B&B, would like. But it must now be on the radar of a growing number of folk music performers and their fans. This is no ordinary rural purveyor of a comfortable bed and a ‘full English’ to follow because St Cuthbert’s also puts on what the Sutherans call ‘house concerts’ featuring folk performers of the highest quality. Heading their way on Easter Monday, April 6, are Kathryn Roberts and Sean Lakeman, two of `the foremost names in folk. Jeff, who as usual urges us to “spread the word”, regards the husband-and-wife duo as folk ‘royalty’. This ‘royal couple’ did indeed get the nod as best duo at the prestigious BBC Radio 2 Folk Awards in 2013 and they were also nominated in the best song category. They head to the Northumberland coast with a new album up their sleeves. It’s called Tomorrow Will Follow Today and it is the fifth they have recorded together since 2001. It follows Hidden People, which was released in 2012 to be hailed – after a nine-year recording gap – as a triumphant return for the pair. Sean Lakeman, brother of fellow musicians Sam and the Mercury-nominated Seth, grew up in Devon and began playing guitar at the age of six. As you might imagine, it was a musical family. The boys joined their parents, Geoff and Joy, in a family band. Early in his career Sean played guitar with the Lakeman Brothers, with Seth on violin and Sam on piano. He also toured with Tom McConville, a virtuoso fiddle player, on the folk circuit. Meanwhile Kathryn Roberts, a talented young folk singer from Barnsley, was making waves with her friend Kate Rusby. Their album, called simply Kate Rusby and Kathryn Roberts, was voted album of the year by Roots magazine in 1995. At about that time the pair asked the Lakemen Brothers to accompany them as backing band on a tour of Portugal. On their return, the five of them formed the band Equation, the name supposedly referring to their initials – KR2 + SL3. It’s the sort of thing you might expect to see carved into the trunk of a tree with a Cupid’s arrow shot through it – although one of the KRs, Kate Rusby, left shortly afterwards, to be replaced by Cara Dillon, whose initials didn’t fit but whose voice did. Romance did blossom for Sean and Kathryn, who are now married and have seven-year-old twin daughters, Poppy and Lily. Since all the members of Equation went on to great things, it is remembered fondly as something of a folk supergroup by aficionados. Jeff Sutheran takes up the story, saying: “The Roberts-Lakeman name has become synonymous with quality during their musical careers, which started when they were signed to a major label as teenagers.” (The couple are now 40 and 41 respectively). “Now, after nearly two decades in music, Kathryn’s sublime vocals merge seamlessly with Sean’s deft and inventive live guitar work on stage and his award-winning sonic skills in the studio. 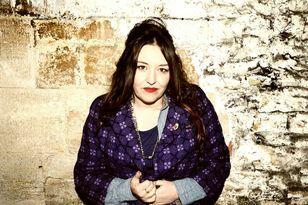 They will be supported by Hattie Briggs, a singer-songwriter from Gloucestershire who bailed out of a Russian degree at Oxford University last year to focus on her music and was duly nominated for the BBC Radio 2 Young Folk Awards. The 21-year-old’s debut album, Red &amp; Gold, will be released on the day of the Seahouses concert along with a single, A Beautiful Mind. The album includes a cover of Eva Cassidy’s version of Fields of Gold produced by her brother, Dan, who also contributes a violin solo. St Cuthbert’s House is a music venue almost by accident. Jeff, born in Hartlepool, and Jill moved to Seahouses because they thought it would be a good place to bring up their four children. They put in an offer for the old manse and only later discovered the rundown church came as part of the package. It lay empty for six years while the couple did up the house but then they set about transforming it into the award-winning B&amp;B it has become. As music lovers, the idea of putting on concerts followed naturally. The first took place in March 2013 and the fact that they have come along at regular intervals ever since testifies to their popularity. Tickets for the Easter Monday gig by Kathryn Roberts and Sean Lakeman cost £12.50 each, from (01665) 720 456. All monies paid, says Jeff, go directly to the artists, which is apparently the house concert tradition.